WHY CONSIDER THE JRMP1420 UNIVERSAL MOUNTING KIT? 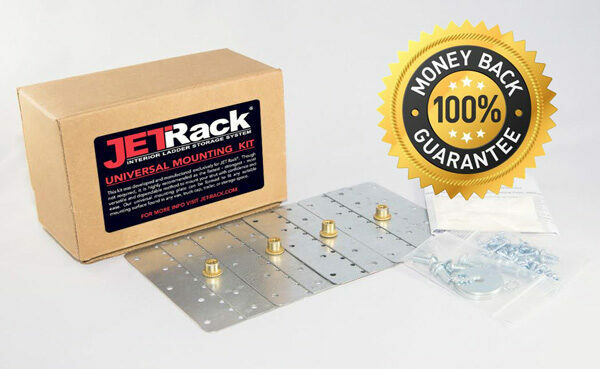 When JET Rack was first introduced, the variety of mounting locations and conditions were so vast, we resisted offering a “one method applies to all” mounting solution because we could not guarantee or even find that one affordable and easy to use method. So we developed one specifically for JET Rack®. The JRMP1420 features unique dual-layer welded-plate design with an integrated, high-strength fastener. A specialized perforation pattern allows no-tool bending of the plate to form around the square stock framework found in most aluminum truck caps. For other situations such as vans, trailers and more, the JRMP1420 may be gently formed, bent, peened, or trimmed to fit almost any shape necessary to achieve a solid, reliable, and long lasting installation. These features combine to deliver the strength and flexibility required to tackle an almost unlimited variety of mounting surfaces and locations. Though each mounting plate weighs only 2oz, our testing has shown the JRMP1420 capable of supporting dynamic weight under extreme forces far beyond anything that your JET Rack will experience under normal, everyday use and driving conditions. No longer guess if your fastener will be able to support your JET Rack installation with the JRMP1420 – it will, and we guarantee it 100% or your money back! (sold separately) used for the JET Rack® system. • FORMABLE – and easily trimmed to fit your unique application. • INTUITIVE Design and simple, 1-page instruction. • NO MORE GUESSING if the fastener you’re working with will hold – it will! • GUARANTEED – Return product for replacement or full refund if it fails. IT WORKS – Distributes the load across any suitable mounting surface.